Pounds or Inches Lost: I lost 48 pounds and was featured in Men’s Health magazine! I used to workout since the age of 21, when I was in college, but ever since I started working, my life was restricted to a chair, a desktop computer, 8 hours a day, 5 days a week. This, coupled with eating lots of chips, soda, and fast food at my desk made me shoot up from 140 pounds to 192 in almost no time. The two final nails in the coffin were when people starting to wonder on which side of 30s I was on, since I was just 26 at that time. The other one was when kids repeatedly used to call me an ‘uncle’. This made me realize that I was ‘actually’ looking more than 30 as I had a bulging tummy and wore size 38 trousers. It was then I made a plan to get back in shape and gave myself a whole year to look and feel great again. I wasn’t able to get a right combination for all three, so I went to a fitness instructor, who designed a workout plan, keeping in mind my work schedule. As for the diet, I followed it religiously and tracked whatever I ate and whatever I worked on in a little diary that I always carry with me. I tried keeping a record of it using Excel, but feel more comfortable carrying a diary since I can revisit my old workout routines and diet plans. Another thing to note was that the music at my gym wasn’t too great for my taste, so I always kept loading my iPod with songs and videos that would make me rush straight to the gym. Personally speaking, I never listen to hip-hop or rap music, as the lyrics can be distracting, instead I prefer to listen to songs that will make push for that extra rep.
For diet, I knew that if I wanted to get back into shape, I would have to eat clean. My first diet plan was simple – to cut out on fast food stuff, soda, and chips, and to gun for a certain number of calories per day. The equation that I used was ‘Ideal Weight X 15’. After making a few dents into my fitness goal, I decided to study more about good and bad carbs, and realized where I was going wrong after I hit a plateau in losing weight – I was taking in more of bad fats and bad (simple) carbs. I quickly replaced my carbs with whole-wheat products, and left out bad fats such as egg yellow (minimum permitted cholesterol level per day for us is 300 mg, and each egg yellow has 200 of it. Go figure). Once I saw major improvements in me, I once again changed my diet plan to include 55% proteins, 25% carbs, and 20% fats. The key thing to note here is that I constantly re-visit my workout and diet plans and change them, if required. As of now, I probably know the nutritional breakup of almost all common food items at my finger tips. This knowledge helps me whenever I dine at a restaurant or go out of town on a vacation, where I don’t have my supplements handy. For training, as I mentioned it before, I constantly revisit my workout routine to prevent from monotony and hitting a plateau. I often switch between a full-body circuit training program, 4 days a week, and a 5-day workout program wherein I focus on each body part once a day. When I began my goal, I was using the routine below (under weight training section), which was kind of light for me since I had to make sure my heart gets used to this new kind of workload. Taking out time to complete my workouts. With a hectic lifestyle, 10 hours of office work, I had to sacrifice some of my after-office activities to take out time for my workouts. 4 months. But the final results took about a year. Its been 6 months now since I’m at my current weight. Even though I am 30, most people have said it that I don’t look a day over 27. It feels good as more and more people come up to me for tips and advice on how to lose weight. 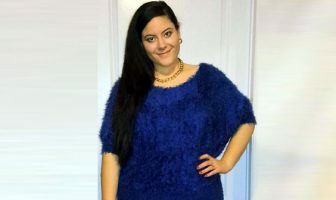 I’ve read a lot of articles on ShapeFit.com, specifically pertaining to diet tips that have really helped me to customize my workout diet and routine. ShapeFit has covered it all. Right from diets to workouts to actual motivational cases. I don’t have to hunt through information across 100 different websites anymore. The articles, workout plans and diet tips I used on ShapeFit.com made it possible for me to get featured in Men’s Health Magazine in India (read my article below)! Be honest to yourself. If you are cheating on your diet, you will not get results. Always track your workouts and diet. It helps! Never, ever skip your workouts. 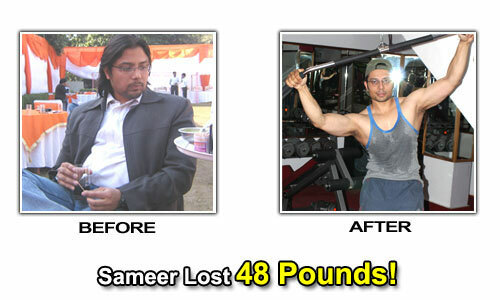 Sameer’s Weight Loss Eating Plan! Shake 30 ml Quaker Oats 3 spoons (30 gm) Horlicks 10 gm followed with Shake 30 ml Pear whole Honey spoon(s). Soybeans 100 gm Egg white egg Barista Chicken Tikka Sandwich followed with a second lunch Soybeans 100 gm. Shake 30 ml Egg white egg Nutrella. Monday: Chest, obliques, and cardio (30 minutes chest, 20 minutes obliques, and 20-30 minutes cardio). Tuesday: Triceps, biceps, forearms, upper and lower abs, and calves (20 minutes triceps, 20 minutes biceps, 20 minutes of abs, 10 minutes of forearms, and 15 minutes calves). Wednesday: Back, obliques, and cardio (30 minutes chest, 20 minutes obliques, and 20-30 minutes cardio). Friday: Shoulders, upper and lower abs, calves, and forearms (30 minutes shoulders, 20 minutes abs, 10 minutes of forearms, and 15 minutes calves). 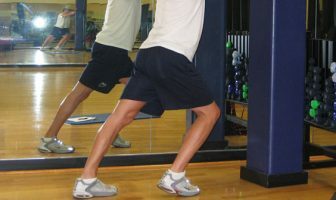 Saturday: Hamstrings and Quads, obliques (40 minutes legs, 20 minutes obliques). Every other day, I do 30 minutes on treadmill.